How ‘bout dem O’s, hon? Baseball season started this week, and here, in Baltimore, it’s also the start of crab season, the crustacean, not the grass, although that is starting up, too, after a ghastly frigid winter. Growing up in Michigan, my knowledge of fresh seafood was limited to fried lake perch and steelhead trout, the latter of which, by the way, is better than any salmon you’ll find in Alaska or Scotland. Occasionally, you’d get frozen shrimp or scallops or, in the very best restaurants, you’d find a tank of cold water lobsters. 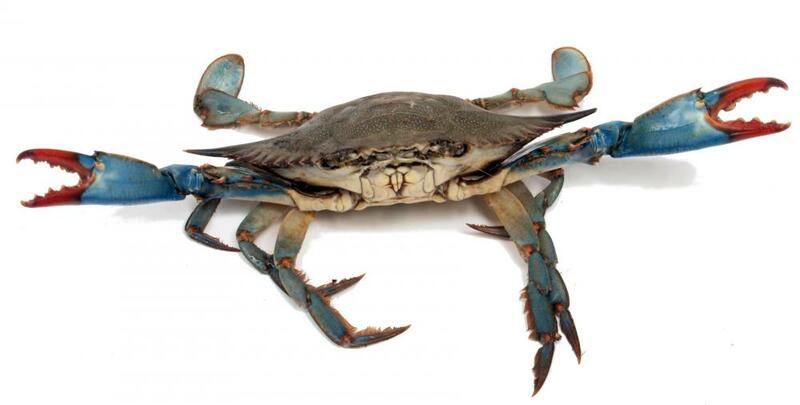 In the 70s, King crab and snow crab legs started showing up on seafood buffets, but the Veterinarian, a Virginia native, used to wax poetic about blue crabs, of which I’d never heard. “Were they sweet?” I asked. Yes. 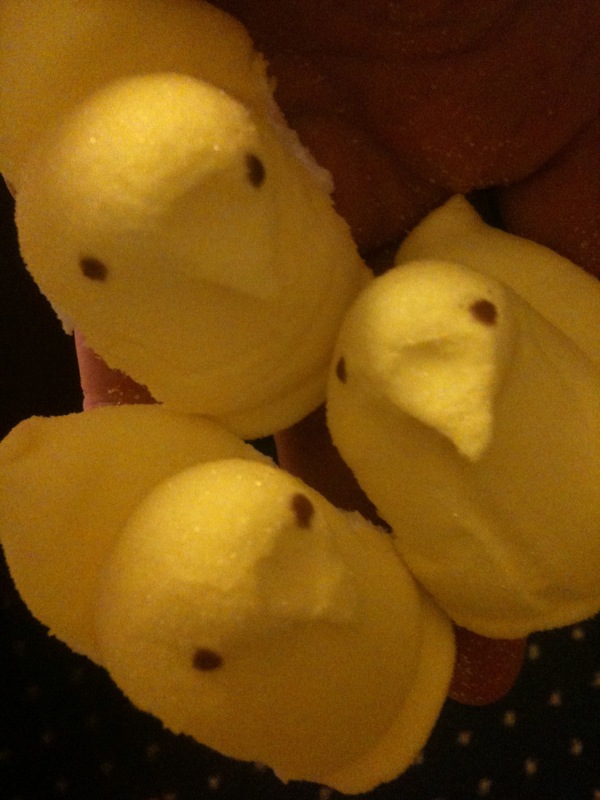 “Did you swish them around in butter?” No. He told me they were steamed with a salty, spicy coating, unless they were soft, when they were gently sautéed in butter. I couldn’t grasp what he was talking about. One summer, when we were still in college, we made a car trip to Williamsburg, Virginia to visit his family. We ate all the local specialties, Smithfield ham and ham biscuits and peanut soup and, heaven forbid, cornbread loaded with sugar (the great debate of our marriage — sugar or no sugar in the cornbread). Still, he was on a quest for crabs, which took us down the Colonial Parkway toward Yorktown, that flat bit of marshland where the British general, Charles, 1st Marquess of Cornwallis, surrendered King George III’s army to General George Washington, ending the war for independence. 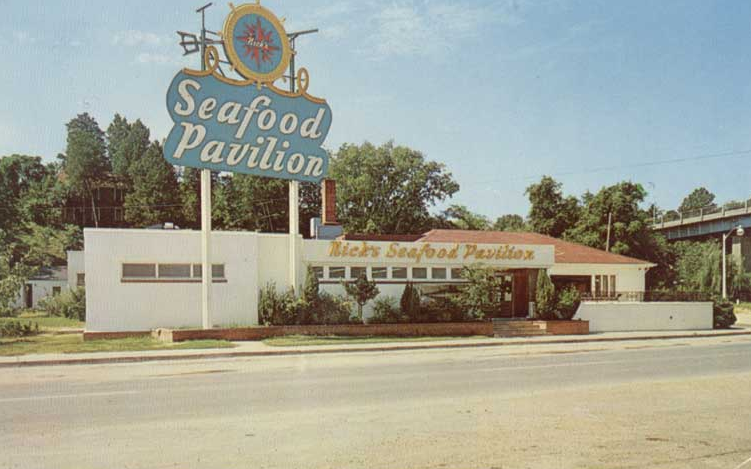 The Veterinarian had childhood memories of a seafood restaurant called Nick’s Seafood Pavilion. It was a quirkily elegant place of larger-than-life copies of Classical art and a vast menu of everything briny. Not recognizing most of what I saw, I safely ordered the fried scallops. My husband was beyond excited to have his fondest dreams come true; soft shell crabs were on the menu. I knew he liked all manner of unusual food (he was the first person that I ever saw eat a whole lobster, and he ate really stinky cheese before stinky cheese was fashionable), but I had no idea what to expect. Our waitress brought me a beautiful platter of plump, delicately breaded and fried scallops. I was oohing and aahing over them, when I was abruptly distracted by the platter she set in front of the Veterinarian. It contained what I thought were two enormous insects that had been breaded and sautéed, a plate full of spindly legs. “You want to try one?” I looked up to see a spindly, battered leg hanging from his lower lip like a cigarette. But a more disgusting consumption of soft shell crabs was yet to come. 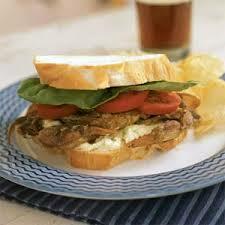 Not long after we moved to Maryland, we went to lunch at a little restaurant on the Chesapeake Bay, where he ordered a soft shell crab sandwich, which is nothing more than a sautéed crab on lettuce and tomato, between two slices of white bread slathered with mayo. And, yes, the legs hang out of the crusts of the bread, and you eat the whole thing. Well, I didn’t, but he did, and he even taught the Daughter, who hails from Colorado (long story), to enjoy them. In Maryland, eating steamed crabs has its own etiquette. Newspaper or brown butcher paper is spread on a table, usually outdoors. The crabs are steamed by the bushel-full in a crust of Old Bay spice (a blend primarily of salt, red pepper, celery salt, black pepper, garlic salt, white pepper, onion salt, paprika, and more salt) and dumped on the table, with their bright red bodies and legs and shriveled up black eyes staring at you. Then, diners take sharp knives and wooden mallets to pry open the shell, crack open the legs and claws. They scrape off faces (of the crabs, not the people) and the lungs and all that other slimy-looking gunk that only an experienced Marylander recognizes. The process takes hours. No kidding. Hours. You can sit down at 1 in the afternoon and still be sitting there at 8 in the evening. Since I prefer not to dismember my food before eating, I am always the wet blanket at a crab feast for hours, a social problem that many transplants to Maryland never get over. If I’m lucky, there will be Silver Queen corn dripping in butter, maybe saltines, and, if the stars are aligned, there might be Maryland crab soup, or, if I’ve been living right, a crab cake or two. If I can manage to look really pathetic, someone will pass me a lump of crabmeat, the prized nugget on the back of a crab. There are only two per crab, so I must wait patiently for hours. No one likes to give up their lumps. Basically, I sit there for hours watching people play Whack-a-Crab for hours. Did I mention how long it takes? 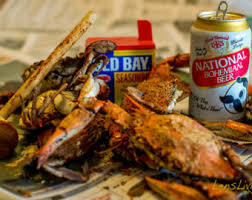 Traditionally, the Baltimoreans (not to be confused with the Baltimorons) crack open a Natty Boh (or something from my friends at Heavy Seas) to kill all that salt in the Old Bay and follow it all up with Berger cookies for dessert. Any crabs that aren’t eaten are picked over for soup or crab cakes the next day. You see, I love blue crab meat. There is nothing better, but I simply cannot pick crabs by pulling off their spindly legs and ripping open their shells with my bare hands. All through the long, cold winter, I dream about Crab Cakes (broiled, not fried, for me), Crab Imperial, Hot Crab Dip, Crab and Smithfield Ham, Crab Balls (no, crabs don’t have them, but you can make them), Crab Claws, Crab-Stuffed Rockfish, Cream of Crab Soup, Maryland Crab Soup, and Crab Quiche. Now, if I can only understand the local fascination with lacrosse, I might become a true Baltimoron. I already make the best crab cake in Bawlmer, hon, so, who am I to complain? Life is good (mostly). Soli Deo Gloria! Crab cakes are controversial around here. Fried or broiled? Binding or not? Old Bay or not Old Bay? That’s the question. Well, if they’re Maryland crab cakes, I think they need just a tiny bit of Old Bay, but not so much that it overwhelms the sweet crabmeat. I broil mine, because it seems a shame to turn any crabmeat into dry crusty flakes. And, if you’re a genius cook, skip the binding. I am an experienced cook but no genius. I like a little soft bread crumbs to hold the thing together as it cooks, so it doesn’t ooze into a mess on the baking sheet or fall apart when you’re trying to plate them. For a special treat, make a sauce by boiling down heavy cream to thicken it, and stir in a little prepared stone-ground mustard to taste. I like mine just slightly tangy, a perfect complement to the sweet little cakes. And fresh Silver Queen corn sweetens the deal as an accompaniment in the summer. I’m sorry to say, if you can’t get fresh, blue crabmeat, the other stuff just doesn’t work. Also, gently pick through the crabmeat to remove all remnants of shell, cartilage, seaweed, or other unsavory looking items. Nothing worse than a mouthful of shell. Preheat regular oven to 400° or convection oven to 350°. Prepare a baking sheet with butter, cooking spray, parchment, or a silicone liner, and set aside. In a large bowl, whisk egg until yolk and white are combined. Whisk in mayonnaise, Old Bay, pepper, lemon juice, Worcestershire, and garlic powder until smooth. Gently fold in crabmeat, taking care not to break up lumps. Sprinkle bread crumbs over the surface of the mixture and very gently fold in. For dinner-sized servings, scoop crab mixture into six mounds on the baking sheet. Bake in preheated oven for 15 minutes or until lightly browned. If using a regular oven, you may need to run them under a broiler until lightly browned. For cocktail-sized servings, scoop crab mixture into 12 mounds on the baking sheet. Reduce baking time to 10 minutes or until lightly browned. Heat heavy cream in medium-sized skillet until boiling and thickened. Stir in mustard and remove from heat. Spoon onto serving plates and top with crab cake and optional cooked, Silver Queen corn kernels and sugar snap peas. Categories: Food, Now & Then, Recipes | Tags: Baltimore, Chesapeake Bay, Cooking, crab cakes, crabs, Humor, Maryland, Virginia | Permalink. How did you learn to cook? Maybe you didn’t. Some people learn from their mothers, but My Mother wasn’t very experimental. She knew what she knew, and that’s what she cooked. She made the usual comfort food, pot roast, fudge, and spaghetti. She also made foods unique to where I grew up in Detroit, like stuffed cabbage with sauerkraut and City Chicken, and food from her old Kentucky home that no one north of the Mason-Dixon line had seen in the 1950s, like cooked eggnog, Red Velvet cake, and unsweetened cornbread. She only owned one cookbook, Betty Crocker’s Picture Cookbook, so my exposure to international cuisine was limited. The book that started it all for me. of The Joy of Cooking, the 1971 edition of the classic by Irma Rombauer. I had never heard of it and found it daunting, as I leafed through it. Make my own stock? What was wrong with Campbell’s soup in a can? Béarnaise sauce? What was tarragon? Pâté à choux? Cabbage paste? They seemed so exotic. So time-consuming. So uncomfortable. 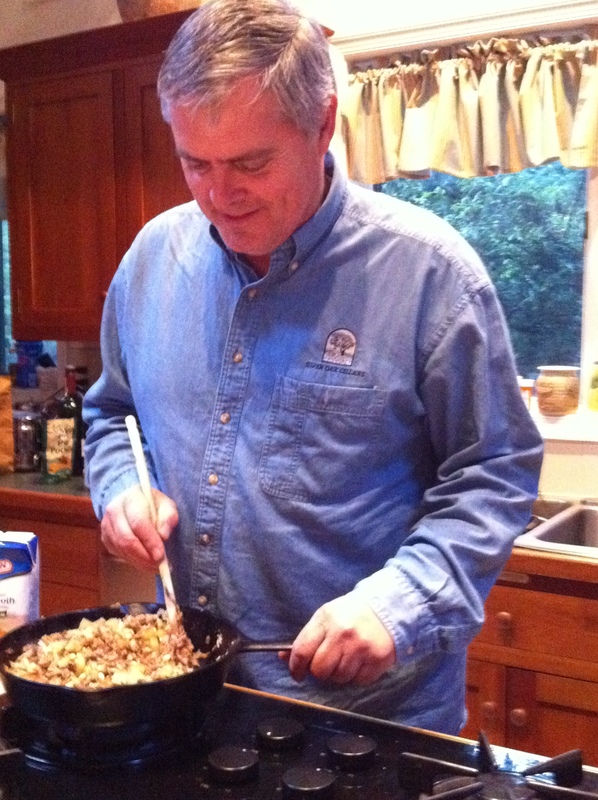 The Veterinarian knew how to cook bacon, eggs, and that mid-Atlantic mystery food of his childhood, scrapple (Rapa-brand, of course). His mother made the food of her Virginia childhood, fried chicken, fried chicken livers, and scrambled eggs with shad roe (the accompaniment to the scrapple). She passed along to her son her mother’s recipe for chip dip, cream cheese flavored with Worcestershire sauce. Armed with Joy of Cooking and the current edition of Betty Crocker, we set up housekeeping. Within months, we gave our first dinner party for another couple. We decided to have ham (because who can’t heat up a ham? ), scalloped potatoes, a vegetable that escapes memory, and cheesecake for dessert. From Betty Crocker, I had learned to make a medium white sauce for the potatoes, and the results were a revelation of creaminess. The cheesecake was an easy recipe from my best friend’s mother. I put the softened cream cheese in the blender with the eggs, sugar, and vanilla, and, when it stuck to the sides of the jar, I scraped it down with a wooden spatula, WHILE THE BLENDER WAS RUNNING. Soon, we branched out. We couldn’t afford to dine out often, so we cooked for ourselves. 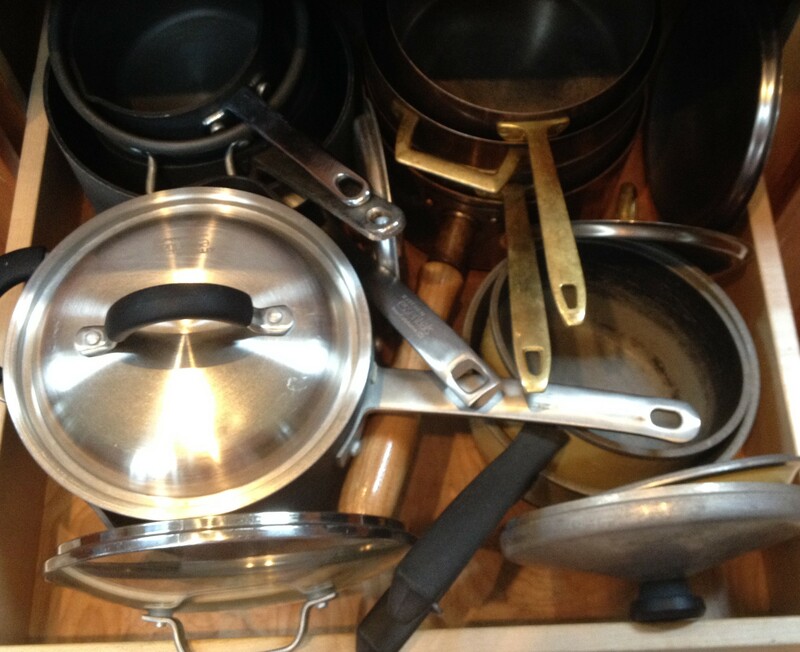 There was lots of trial and error, but, mostly, we found that, with regular practice, cooking wasn’t so hard. 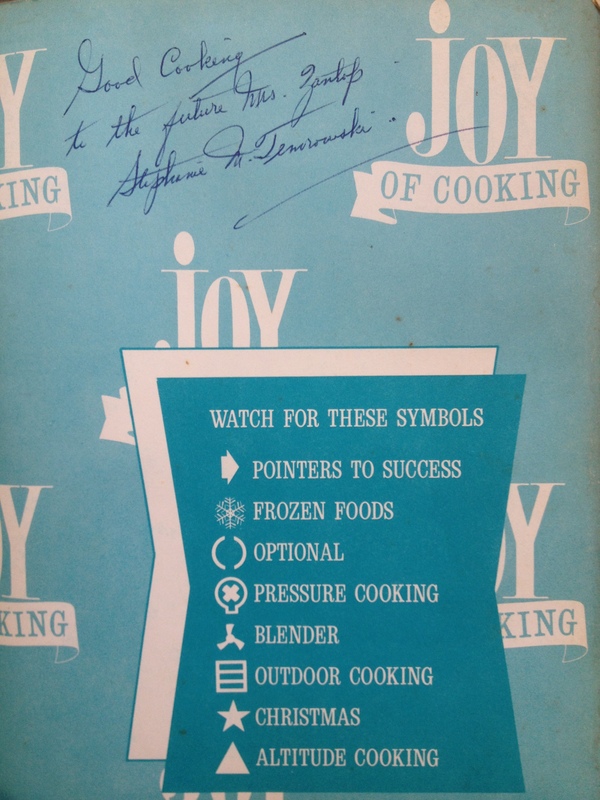 We watched Julia Child, Graham Kerr (the Galloping Gourmet), and a wacky minister who went by the name “Frugal Gourmet.” We delved into that Joy of Cooking, whose step-by-step directions and explanations of buying and storing food revealed techniques and tastes that we had never imagined. 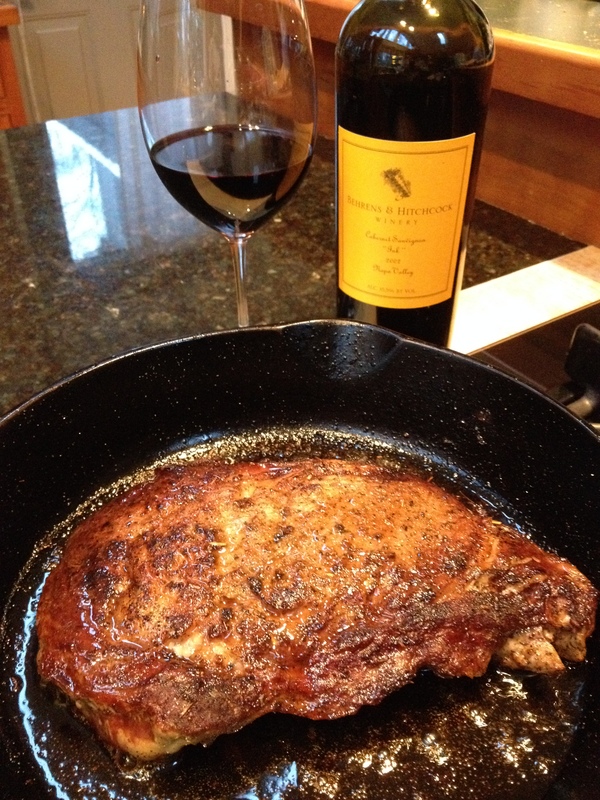 We started cooking with wine, real wine, not that salty stuff labeled “Cooking Wine.” We started drinking better wine, too. 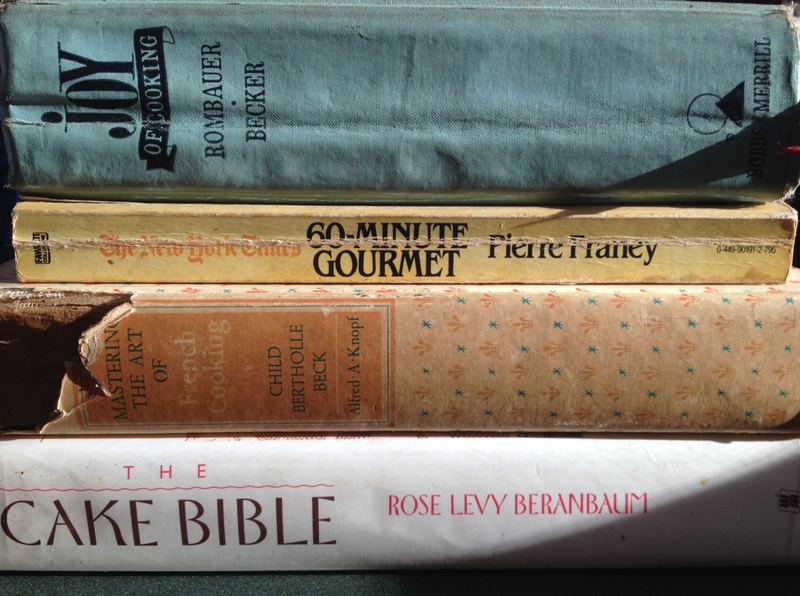 We acquired even more cookbooks, such as Pierre Franey’s 60-Minute Gourmet, which taught us to cook efficiently with fresh ingredients, and Rose Levy Beranbaum’s The Cake Bible, which explained the chemistry of baking. Within 10 years, we were full-fledged foodies. As we began to travel, restaurants famed and unknown were always on our must-sees. We returned home to reproduce our favorite dishes either from memory or from their cookbooks, such as Union Square Café in NYC (for the Tuna Burger and Garlic Potato Chips), The Inn at Little Washington (for the Butter Pecan Ice Cream and Caramel Sauce), Paul Prudhomme’s Louisiana Kitchen (Etouffée and Blue Cheese Dressing), The Ivy in London (Roast Poulet des Landes), and Hawaii’s Roy’s (Chocolate Soufflé). The two very best recipes came from Chef Cindy Wolf of Baltimore’s Charleston. 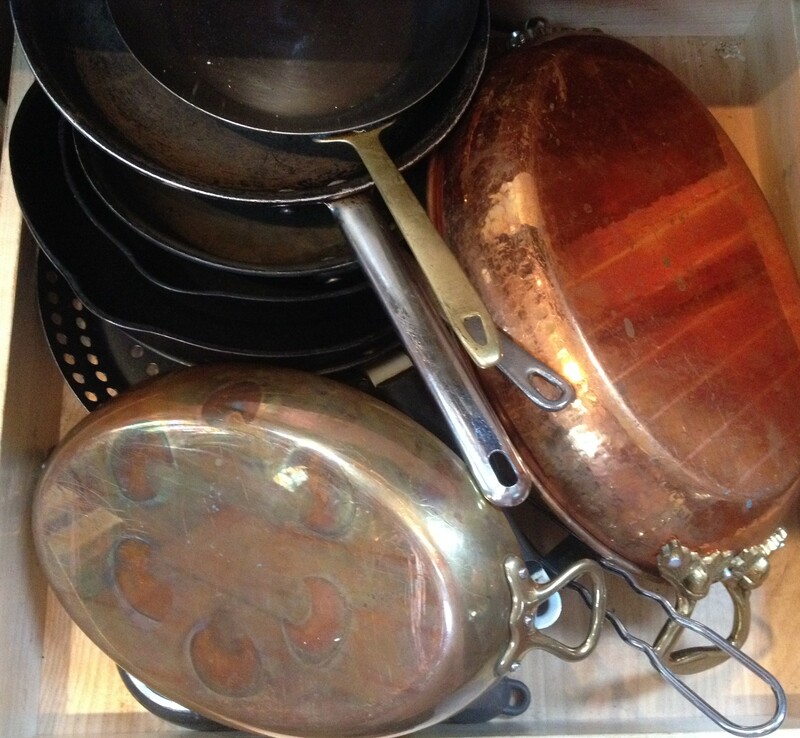 She shared her stock and lobster bisque recipes, which The Veterinarian adapted and left me. Yep, he actually left lobster and veal stock and a Paul Prudhomme gumbo in the freezer, proving you can’t take it with you. With the advent of Google, there is almost no recipe that you can’t find online. In fact, you can find hundreds of recipes for the same dish and can pick and choose between them to create a unique version. I learned to make my own Tom Kha Gai soup that way and have lowered the fat in the Cheesecake Factory’s Louisiana Chicken Pasta. Some things never change. I still use the Betty Crocker fudge recipe that My Mother used. I still make the best real Red Velvet cake with Buttercream Frosting and an awesome stuffed cabbage with sauerkraut. I’ve adapted the City Chicken to simmer in white wine and veal stock, unheard of in 1950s Detroit kitchens, and I actually learned to make that pâté à choux to reproduce Detroit’s favorite Sanders’ Hot Fudge cream puff shells. My one month trial to chemistry expired, so the site “treated” me to a free month. 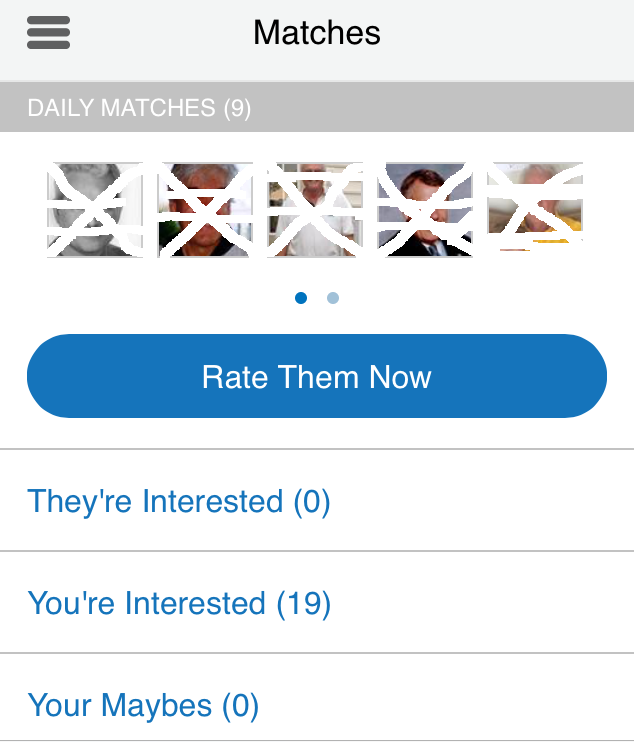 When I declined to renew my match subscription, they offered me three free months. Good. I’ll still have something to write about. This morning alone, the scammers are either cloning each other, or there’s just one guy or gal with a lot of time on their hands. The theme is “I will love to know you better [sic], as long as you have a pulse”, although I suspect that may be optional, if I, the “lonely” little widow, can provide access to my bank account. You be the judge. 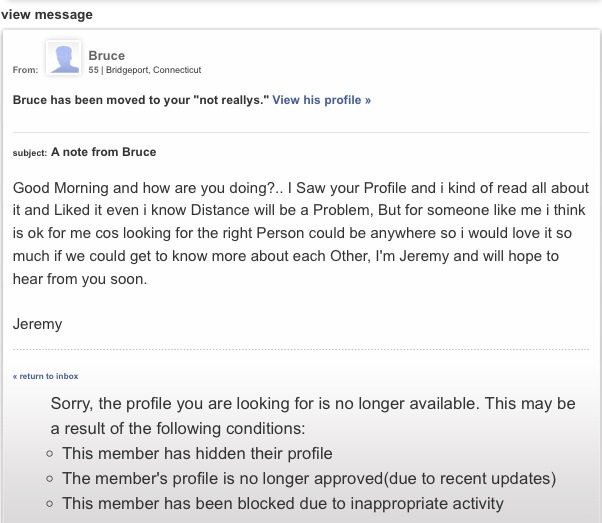 His profile disappeared because someone else complained about him before I opened the email. 105? Really? 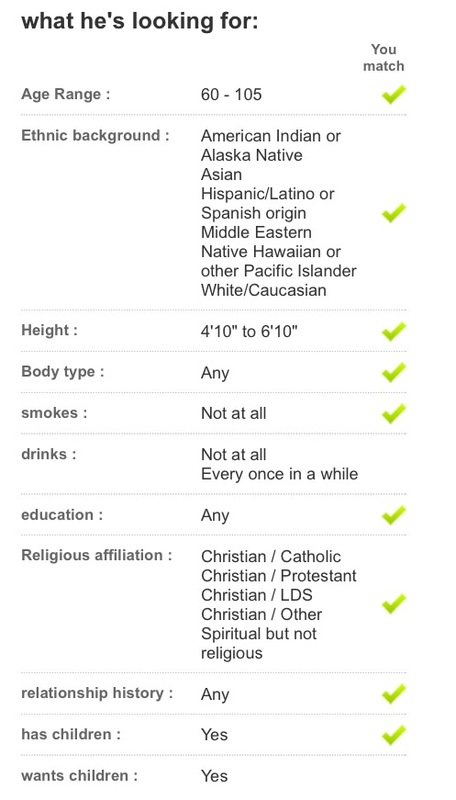 I’m soooo flattered to be included! Well, I’m not lonely enough for that, so, who am I to complain? Life is good (mostly). Soli Deo Gloria! 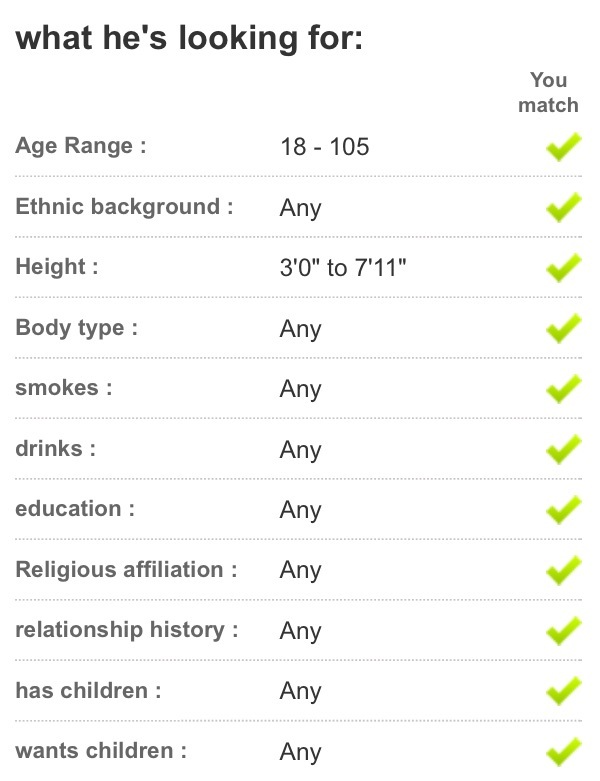 Categories: Dating, Food, Now & Then | Tags: Cooking | Permalink.